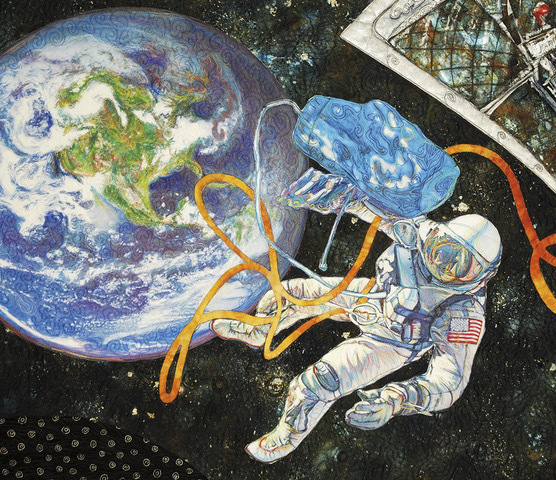 Above: Celebrate 50 Years of NASA (Detail 6) by Denise Currier, Mesa, Arizona. The i.d.e.a. 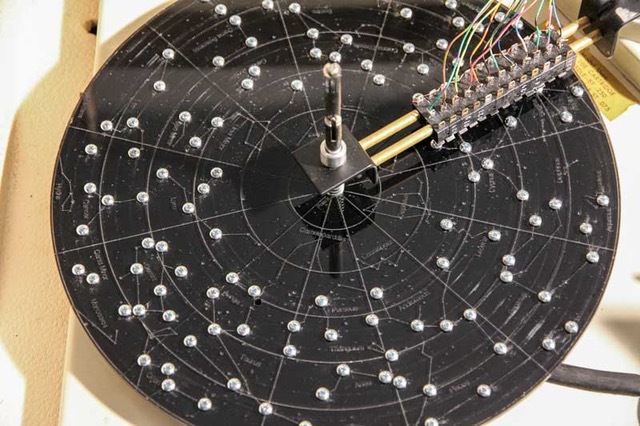 Museum’s new exhibition, Far Out: Our Solar System, highlights artwork, hands-on activities and popular cultural media. 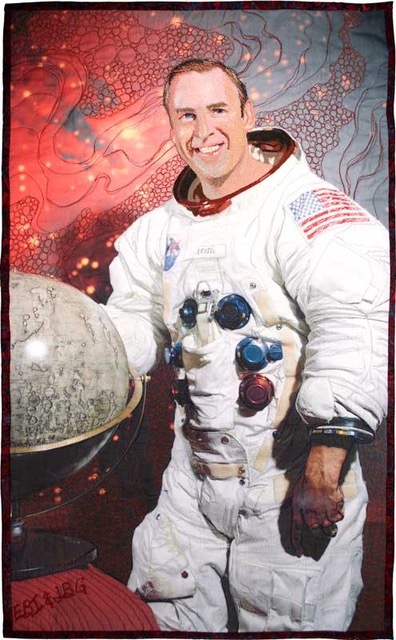 This will help visitors imagine that they are on a spaceship, blasting off from Earth, traveling to the other planets that make up our solar system. 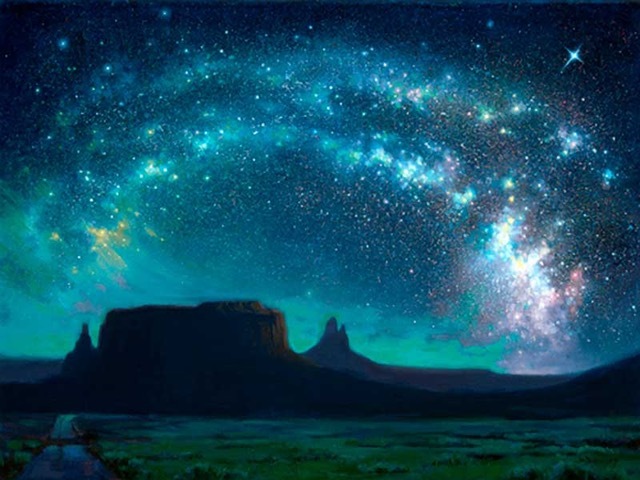 Above: Milky Way over Monument Valley, acrylic painting, by Dinah Jasensky, Tucson, Arizona. The exhibition features art that illustrates the exploration of the eight planets that orbit our sun. Featuring 56 artworks by 20 artists from the United States and Australia, works include paintings, photographs, quilts, wood sculpture, video, digital collages and a site-specific installation. In addition, items from the School of Earth and Space Exploration at Arizona State University are on display. 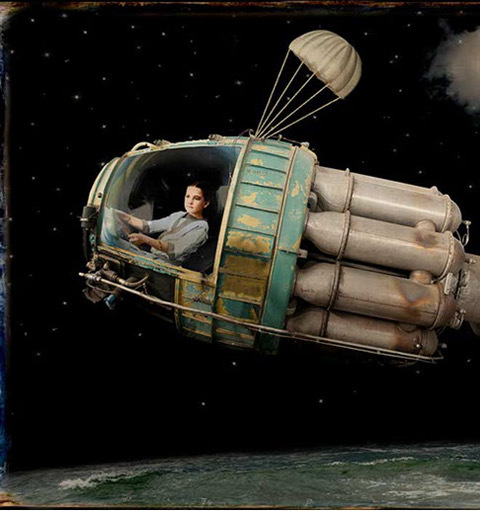 Above: Rocketeer by Corinne Geertsen, Mesa, Arizona. Featured artists from Arizona are: Manny Burruel and Philip A. Cruden, Glendale; Denise A. Currier and Corinne Geertsen, Mesa; Dinah Jasensky, Tucson; and Kristine Kollasch and Deborah McMilion-Nering, Phoenix. Above left: Captain James Arthur “Jim” Lovell, Jr. by Ellen Icochea of Alexandria, Virginia and Jayne Gaskins of Reston, Virginia. 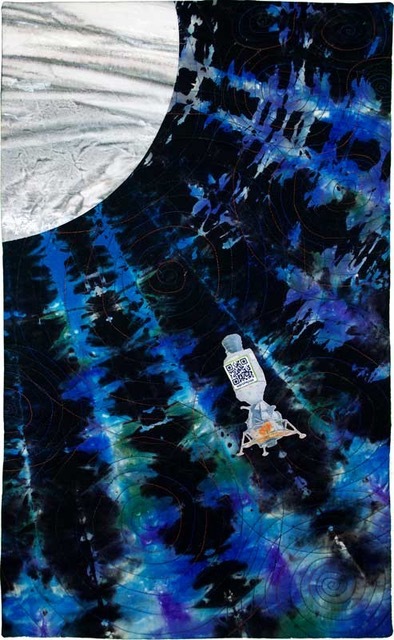 Above right: Fly Me To The Moon, quilt by Diane Wright of Guilford, Connecticut. National artists featured are: Jennifer O’Brien and Diane Wright, Connecticut; Karol Kusmaul, Florida; Jerry Cox, Missouri; Ellen Icochea and Jayne Gaskins, Virginia; Andy Behrle and Christopher Doll, Washington. And, Susan Auden Wood represents Australia in the exhibition. Above: Synthestar by Andy Behrie of Zilah, Washington. Aiming to engage the museum-goer, art-making and other hands-on activities explore what is known about each of the planets and their moons, comets, asteroids as well as minor planets that inhabit our solar system. Activities are created with science, technology, engineering, art and math (STEAM) concepts in mind. Activities include; a space travel simulator allowing visitors to blast off into space in a travel simulator, use a “Passport” to explore and gather facts about each planet, build prototypes of space crafts, examine meteorites and learn one’s weight on different planets. In addition, the Museum’s Black Light Room has been adapted to complement the exhibition. Bathed in ultraviolet light, the kids can explore Area 51. Hint: wear white clothing to enhance the experience. 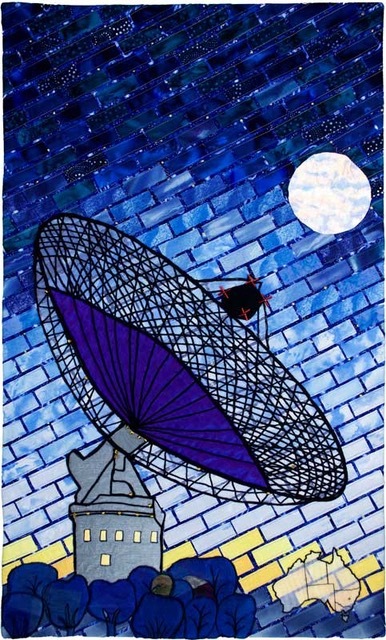 Above: Parkes Telescope, quilt by Susan Auden Wood of Croydon South, Victoria, Australia. The curriculum covers a variety of topics including space, the solar system, sky observations, sun as a source of energy, space exploration and concepts related to weather and gravity. These topics will integrate science, social studies, math and language arts. Far Out: Our Solar System serves as an educational tool. The exhibit will encourage questions about NASA and its mission, the planet Pluto, human travel to Mars, constellations, Earth’s rotation and the concept of gravity.